The Weasley Clock from Harry Potter. Living together with two other roommates, we also wanted to quickly know where people were, like if someone was doing groceries, or who was at home already! The clock comes in two forms: as a physical clock and as an iOS app. The physical clock has four different colored LEDs to represent four different people, and instead of the numbers 1 to 12, there are icons for different locations. 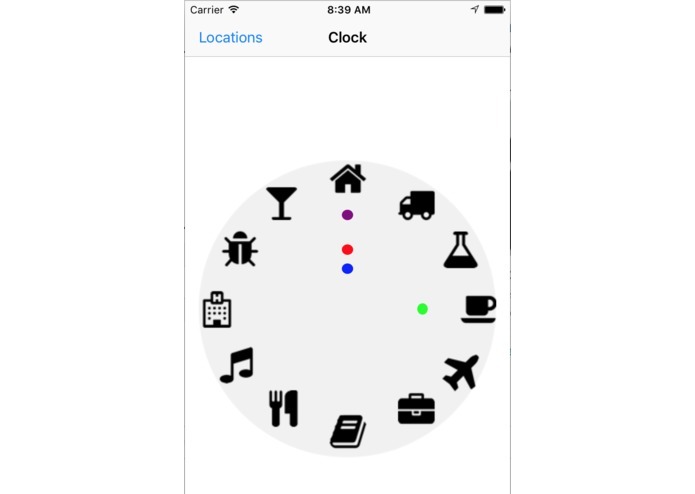 The iOS app acts as the location tracker and updates the physical clock whenever the person's location changes. You can choose your location points, i.e. your work location may be different from another person's. 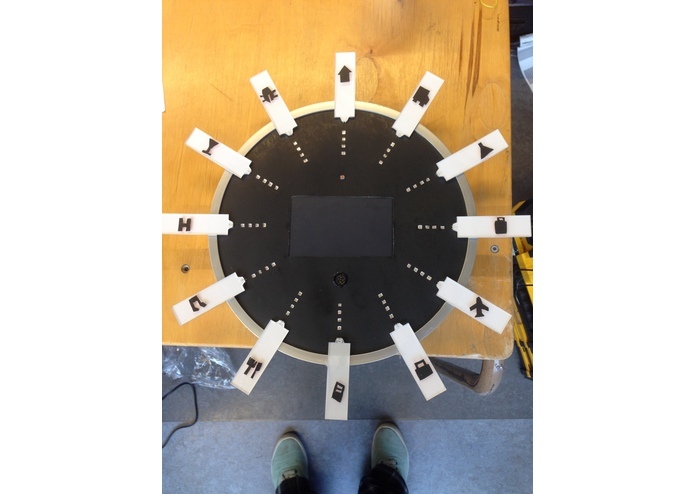 For hardware, we used a Particle Photon, Neopixels, backlit LEDs and LCD screen, a range sensor and a photodiode. The Photon controlled basically everything. The sensors are there to preserve battery life. The iOS app was built using Swift. The Photon had an iOS SDK for interfacing purposes. Unfortunately, the iOS SDK login function crashed because of the XCode and Swift updates... This issue is still very fresh and so we couldn't interface with the Photon through the app :( But we can still use a command line interface for testing purposes. The hardware looks so beautiful! And finally figuring out the navigation for the app. So many things about iOS development, this was Michelle's first stab at it. Everything from MapKit, Storyboard, ViewControllers. Get the hardware and software to properly communicate! Customizable locations and icons, and getting the LCD touch screen working.